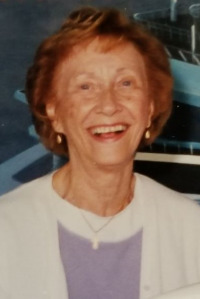 Virginia A. Shea (Cook) died peacefully February 25, 2019. She was 89 years old. She was the devoted wife of the late Daniel Shea. Loving mother of Daniel Shea of Dover, NH, Kathleen Shea of Canton, Eileen Hughes and her husband Richard of Easton and David Shea and his wife Ann Elise of Canton. Sister of the late Chester Cook, George Cook, David Cook and Dorothy McMenamy. She is survived by 12 grandchildren, 4 great-grandchildren and several nieces and nephews. Also survived by daughter in law Vicki Shea and son in law Anthony Pungitore. Visiting hours in the Pushard Family Funeral Home 210 Sherman St., Canton on Friday March 1st from 4-7 PM. Relatives and friends are respectfully invited to attend. A Mass of Christian Burial will be celebrated Saturday in St. Gerard Majella Church 1860 Washington St., Canton at 11 AM. Interment Knollwood Memorial Park. In lieu of flowers, donations can be made to Father Bill's and MainSpring (helpfbms.org) of Brockton or MSPCA.org, two causes that were dear to Virginia's heart.